About 2,000 years ago, some hot magma rising from beneath the surface of the earth met some groundwater and exploded, sending rock and debris flying for miles and creating a 500-foot-deep crater in what is now the northern section of Death Valley National Park. We hiked around the crater and got some great views of this very recent geologic formation. Some people hiked the steep trail to the bottom. For our last few nights in Death Valley, we decided to leave the parking lots of Furnace Creek and Stovepipe Wells and go to one of the more remote campgrounds in the northern end of the park--about an hour's drive. Mesquite Springs is a very primitive campground with no development, no stores, nothing...except some of the darkest skies in the country, and it will be a new moon (i.e. NO moon) when we are there. After we set up, we notice that our neighbors are amateur astronomers and have their telescopes set up to observe the skies. We got to look through the 16-inch reflector that Jim brought and saw some amazing views of star clusters, nebulae, Jupiter and Mars. I woke up around 4 AM the next night and got to use our binoculars on the summer constellations that contain the best deep sky objects around the center of our milky way galaxy. It was fantastic! A view of our campground from the bluff behind us. If you look real close at the center of the photo, you can see our trailer with it's dark rear window. This place was truly in the middle of nowhere. Another highlight on our visit to Death Valley was the hike up Golden Canyon to the Red Cathedral (don't you just love the names they give these places?). This was a vigorous 4-mile loop with a lot of climbing, but the 70-degree weather made it very pleasant. This all-day outing was one of our favorite parts of our stay in Death Valley. You can drive out of the park to the east into Nevada, then turn west on a one-way dirt road that travels 26 miles over the Red Pass and through Titus Canyon back into the valley below. That 26 miles takes about 3 hours to drive! It is a unique opportunity to travel the length of a Death Valley canyon from end to end in a car (or more likely, a 4WD truck like we did). The road was awful, and there were times going over the pass that one wished it had guardrails! After navigating the pass, the road narrows and the canyon walls start to get higher and closer. For the last 6 miles or so, the road snakes between sheer walls of amazing color and variety. Badwater--lowest place in the U.S. The lowest point in the US is called Badwater. It is 282 feet below sea level. For miles around Badwater, there are salt flats, which mostly aren’t really flat and in some places are the most uneven and treacherous terrain I have ever tried to walk on! Since there is no outlet to Death Valley, all the rainfall for thousands of years has washed minerals to the bottom where it evaporates. The salt flats get hot in summer—ground temperatures of 180 degrees are common and it is not recommended to hike there in the hottest months. Death Valley has been created by massive parallel uplifting plates that run North/South along the California/Nevada border. 10,000 years ago it was a lake and now it is one of the driest places on earth, getting an average of less than 2 inches of rain a year--some years it gets none. Just 30 miles to the West, the Sierra Nevada mountains get 30 FEET of snow a year. But as dry as DV is, the effects of water are everywhere. I’ve never seen a place with so much erosion. The mountains that line the valley are cracked with dozens (hundreds?) of canyons that each have produced alluvial fans of rock and gravel that stretch for miles. These canyons contain glaciers of rock that represent the pulverized remnants of the surrounding mountains. 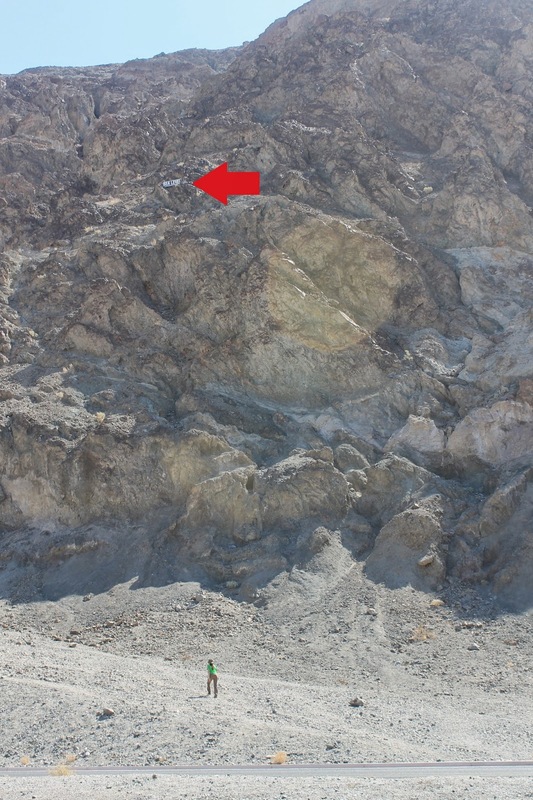 The floor of the valley is filled 7,000 feet deep with eroded rock! The canyons of Death Valley are amazing. We walked up several and even drove through a few. They are living geology lessons and more varied than one would believe possible. Here are some highlight pictures of ones we visited. There is even a place called the racetrack where the rocks slide by themselves. We didn’t risk taking the tire-eating 26-mile dirt road safari to get there, so here is a picture, courtesy of that wonderful internet. No one has ever seen the rocks move but it is thought that after a rain, the surface mud gets so slick that the wind can blow the rocks around. The Racetrack is a dry lake bed that is flatter than a billiard table--less than 1-1/2 inches variation over the whole 3-mile surface! 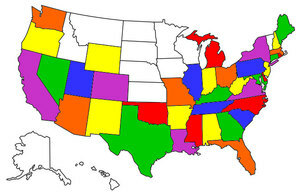 I was surprised to find out that Death Valley was not made a national park until 1994. Before that it was a national monument, which didn’t give it the same level of protection. Mining had been going on in DV since the early 1800’s and there are thousands of mine shafts in the park. Modern intensive mining was starting to take a toll on DV until it was better regulated and now it is essentially stopped. We visited four remnants of the mining period: Rhyolite, Leadsfield, Harmony Borax works and the Eureka gold mine. 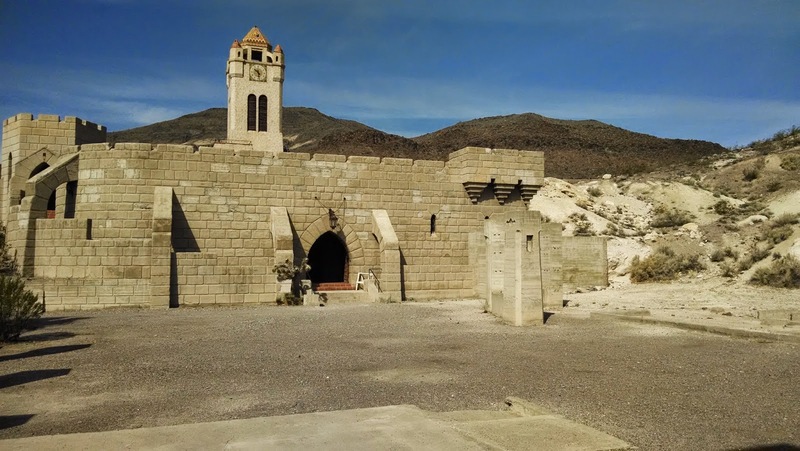 Rhyolite was founded in 1904 and became a boomtown with thousands of residents and two banks. This is one of the bank buildings. Mill for processing gold ore at the Eureka mine. This mine operated until 1945 and produced an estimated $175,000 worth of gold (at $20 per oz. at the time) for the man who owned it. Ironically he lived his whole life in a place where there was nowhere to spend his wealth! In the 1920’s, some of the mining companies were visionary enough to realize that tourism would become the true gold of Death Valley. Two competing lodges were opened, Stovepipe Wells and Furnace Creek Inn and Ranch. They are still the main places to stay in the park either under a roof or in a tent. We camped at both. We stayed at the settlement you see in the middle of this picture--Stovepipe Wells, founded in 1926. The owner built his own toll road into the valley for tourists. 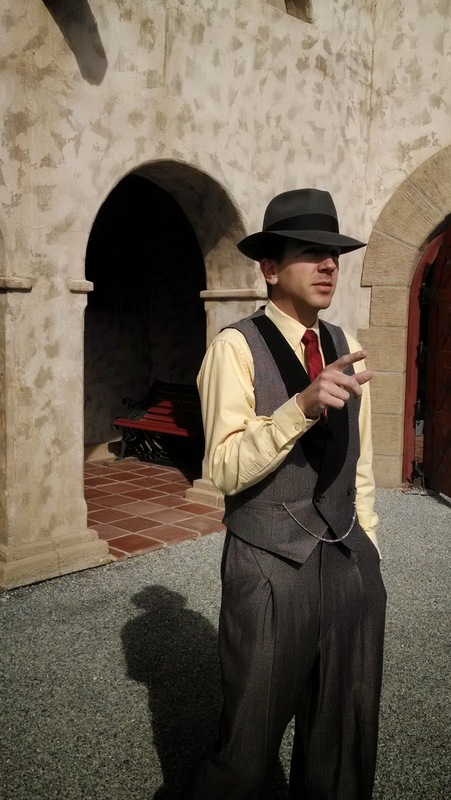 Also in the 1920’s a unique chapter of Death Valley resulted in the estate now called Scotty’s Castle. 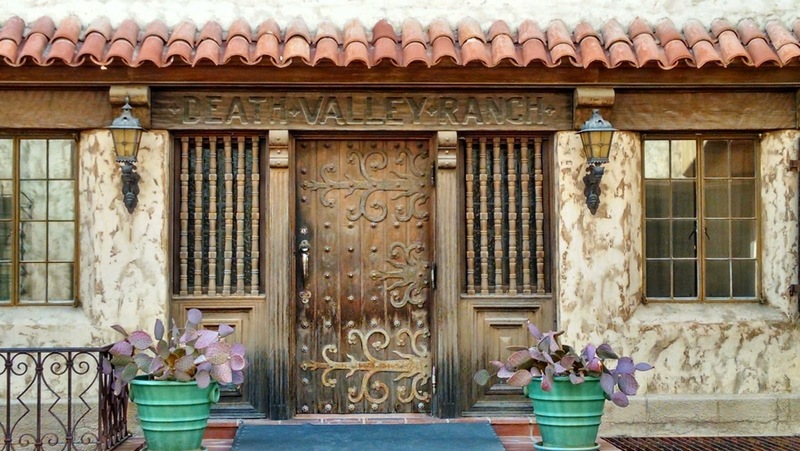 This huge Spanish-style “vacation home” was built by a Chicago millionaire and his wife, but the star of the show was really Death Valley Scotty, who claimed to have built the mansion with riches he got from his gold mine. 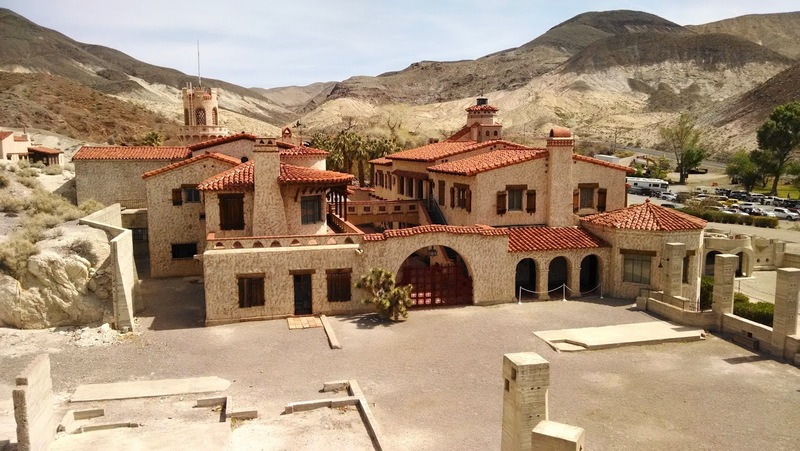 People used to pay to stay at Scotty’s Castle and be entertained by Scotty’s tales of Death Valley, while the real owners of the home stayed in their own part of the house! The complex is an engineering wonder and a pioneering “green” home! Scotty's castle was built at the site of a 250 gallons/minute spring that provided water and electric power for the house. When the railroad closed in 1934, the owner bought 200,000 railroad ties to use for firewood. This is the power house which was built 1n 1929 to house diesel generators to supplement the hydro power provided by the spring. The additional generators were needed to power the 1014-pipe organ brought in to provide music. 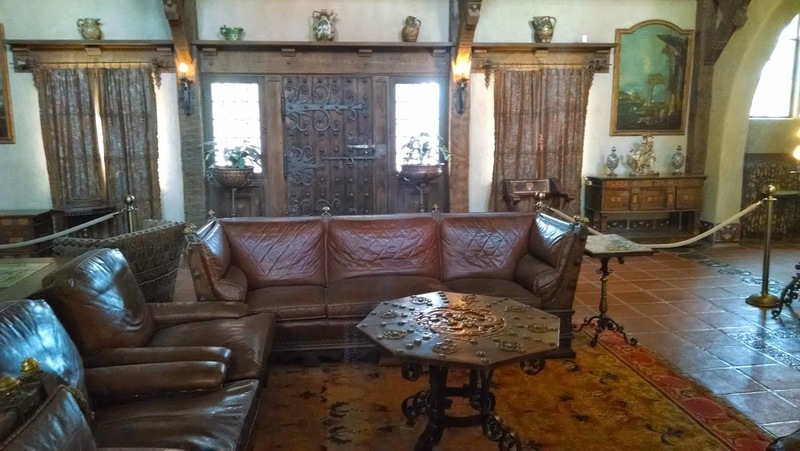 The interior was decorated in Spanish style with no real concern for cost. Before the Depression, the owners' income was over $1 million per year.